Marissa Farrar: Day 2 of Creepfest! Meet author, Ruth Barrett! Today I would like to welcome the very lovely Ruth Barrett! Ruth is the author of the novel 'Base Spirits', a traditional ghost story set in an old Yorkshire house. I was most impressed to learn that Ruth studied acting at the London Academy of Music and Drama (LAMDA). She's now turned her hand to writing, though her book contains influences from her love of the theatre. M.F. Hi Ruth, can you tell us all what inspired 'Base Spirits'? R.B. I was in a Jacobean play-- 'A Yorkshire Tragedy'-- based on the true story of a nobleman murdering his family. I had a chance to visit Yorkshire during the rehearsal period, discovered Calverley Old Hall where the tragedy took place, and was given a tour and a book by a local historian. I found it creepy/cool that you can actually rent the Hall for vacations... and there are a few ghost stories about the place. I just thought it would make a great novel. M.F. I love novels that are based on fact! Have you been writing for long and do you have any current WIPs? R.B. I've always written stories ever since I was a child. I've published a number of short stories over the years, and am working on and off on a few projects including a novel about a Victorian revenant and a character-driven mystery series with a dark comic twist. M.F. What are your thoughts about the recent trend for authors to 'go indie'. R.B. It's the Wild West at this stage. A lot of people are jumping in and tossing undercooked work up onto the websites before honing their manuscripts or having them properly edited. Your name is on that book-- surely you owe it to yourself and your readers to present it in its best form! A lot of others are seeing this as a way to get their writing out and find an audience instead of waiting for a publisher's gatekeeper to decide what is read. In the end, the serious folks with good books will find a good readership base with a slow steady effort, and the ones who are hoping to cash in and become overnight millionaires will give up. Overall, it's very positive for serious writers who are frustrated with the traditional process. I also find that indie authors are a friendly, supportive bunch and that is always encouraging! R.B Not a Christmas ghost, but yes... there have been a few incidents over the years ranging from an 'icky' feeling that something is in the room with me to actual sightings of full figures. M.F. Ooh.. that sounds like a story I'd like to hear more of! What are you plans for this Christmas? R.B. A few local parties with friends, and a quiet Christmas Eve in with my dashing and delightful male companion...! M.F. Merry Christmas Ruth, and thanks for stopping by! Head over to her blog Spirited Words to find out a bit more about Ruth and her work. 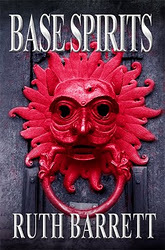 Her novel, 'Base Spirits' is also available to buy from Amazon for $2.99. Many thanks for the interview, Marissa. I enjoyed it and took particular interest in where you both saw publishing at the moment. I have had the pleasure to say hello to Ruth before, and already follow her blog. "Base Spirits" sound like a great read, doesn't it? How did I miss commenting on this? ... busy week! Thanks for having me as a guest, Marissa. And thank you for such lovely comments, James!